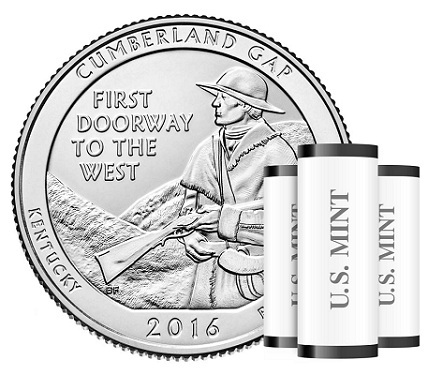 The U.S. Mint is now selling products containing the 2016 Cumberland Gap National Historical Park Quarter, the second of five America the Beautiful quarters due for release in 2016. The Cumberland Gap quarters are available in six product options that offer varying quantities of the issue struck at the Philadelphia (P), Denver (D), and San Francisco (S) Mints. Collectors can purchase bags of 100 quarters with P, D, or S mint marks for $34.95 each. Additionally, a forty-coin roll (S) can be bought for $18.95, a two-roll set (P and D) costs $32.95, and a three-roll option (P, D, and S) is available for $46.95. Quarters minted in San Francisco are not released into circulation, unlike the Philadelphia and Denver issues. The reverse design for the Cumberland Gap quarter was created by Barbara Fox and engraved by Joseph Menna. The image depicts a frontiersman looking west over the Cumberland Gap, which was often crossed by pioneers on their way to Western Kentucky and Tennessee. Inscribed along the rim are CUMBERLAND GAP, KENTUCKY, E PLURIBUS UNUM, and 2016, with FIRST DOORWAY TO THE WEST included in the field above the mountains. The Mint will officially release the new quarter into circulation at a launch ceremony on Monday, April 11, at 11 am ET. For more information on the America the Beautiful Quarters program, please visit the U.S. Mint’s Web site.